It's time for another card made with Doodle Pantry images. This is the card I have made for my husband for Valentine's Day this year. He's going to love it...lol. 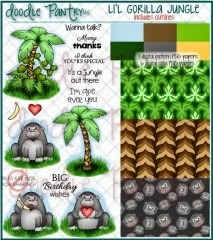 I have used one of Doodle Pantry's brand new sets called Lil Gorilla Jungle. Isn't he cute? I printed the pre-colored image on white card stock and then cut him out by hand. I used a red glitter Sakura gel pen to color in the heart he is holding, as well as a few of the hearts scattered on the background (it's very hard to see it in the picture). The tree and hearts are a cut file from Silhouette's Online Store (Design #72710). This tree is actually a 3d image, but I only cut 1 and I removed the perforation. I cut the tree using white card stock and then distressed it with Going Gray ink so it would stand out a little bit against the white background. The hearts were cut out using red card stock and glued in place over some of the branches. I cut a few extra hearts out so I could place them in the background as well. I added clear crystals in the center of the hearts that are in the tree. The sentiment is also a cute file from Silhouette (Design #56743). I cut this out using red card stock and glued it in place over the trunk of the tree. I used foam dots to pop-up the gorilla. I used the sentiment "I'm ape over you" on the inside of the card. Here is what you get in this set. 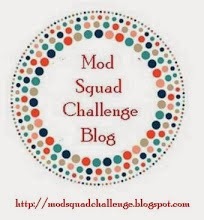 Please join us on the Doodle Pantry Blog for this month's Ants in my Pantry Digital Challenge 2 for your chance to win a gift certificate to the Doodle Pantry store. The theme this month is CANDY. It is a digital challenge, but we also accept hand-stamped images as well. So come have some FUN! Oh Susan, the background you created for the cute gorilla is phenomenal. The icing on the cake is the wonderful sentiment die cut. Awesome card! Great card! Love the gorilla image and the addition of the hearts on the tree! Thanks for joining us at House of Cards! Very cute! I love the sentiment you chose for the inside. Thank you for joining us at Through the Craft Room Door. That is so cute and darling. Wonderfully cute card. Thank you so much for joining in at House of Cards. I'm sure hubby loved it. Wonderful card for your Husband, so fun! Thank you for sharing with us at A Creative Need. So darn adorable. Perfect for a man! Love all the hearts, tree and sentiment. super cute and a great card design! Oh my! This is so super cute! Love it. Thanks for joining us at Great Impressions! Hi Susan, this is so cute! I am with you, I love this guy!! Great card! Someone will be lucky to receive it! Such a cute card! Thank you for sharing with us at Fussy and Fancy and good luck! This is adorable Susan! I love that gorilla and the beautiful tree! Thanks so much for joining us at HOC this month! Adorable card!! - Love the colors and all the hearts in the tree! Thank you for joining us at House of Cards this month. This is just the sweetest card ever. Thanks for joining us at House of Cards.